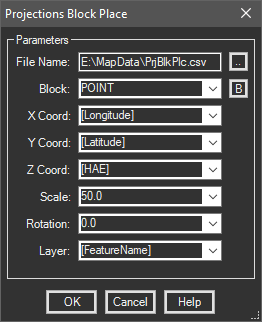 Place inserts into the drawing at projected locations from files containing lat/long values. Additional fields in the file are mapped to block attributes. Simply select the file, choose the appropriate fields and your locations instantly appear in the drawing as inserts. If you don't have a block definition of your own it will build one for you in a single click. All the non-coordinate data populates block attributes so everything is displayed.